After no rainfall in January, almost 2 inches of rain fell during the show, most of it on Saturday. Luckily, the managers of the Murieta Equine Center had widened the ring area in the main covered arena last summer, and two dressage rings fit side by side, leaving the smaller covered arena for warm-up. So even though the roads flooded, the show went on with dry footing. Deborah Hausman posted the show’s high score on her Dutch Warmblood mare Verona (Jazz—Glennridge, G Ramiro) with an 85.8 percent in the Materiale class on Friday. She also won the warm-up and the qualifying FEI 5-year-old classes with scores of 69.40 percent and 72.80 percent, respectively. 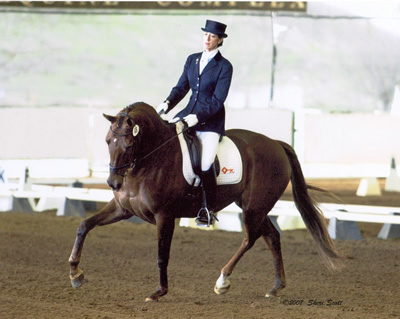 This was the first time that Hausman showed Verona in the 5-year-old class and the first time she’d ridden the mare through the entire test. Hausman purchased Verona last June in the Netherlands and competed with her there in the Pavo Cup. This was their first show in the United States. Gerhard Politz comes to Hausman’s Quailhurst Stable in Sherwood , Ore., each month for clinics. Hausman also rode with Christine Traurig for many years.